New York City, when I was eight, made me feel small. Much smaller even then my slight eight-year-old, hometown-girl-from-Lancaster-County self. The buildings towered. The taxis whooshed. The people knocked into you without an “excuse me.” And I couldn’t hold on to my mom’s hand tightly enough. 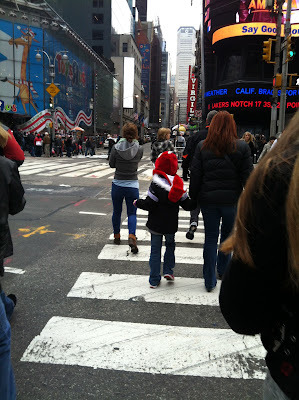 But despite the enormity of it all, New York City captivated me. The purposefulness of the brusquely-walking pedestrians. The surprise of the December wind as it swooped around the corner of a building and stole my breath. The salty, sour pungency of roasting chestnuts that geysered out from a curbside stand. The Santas and ice skaters and toy trains that decorated the windows of Saks Fifth Avenue. After many, many returns to the city, these things that brought such an overwhelming response—that held such allure—to me as an eight year old, have faded over the years. I now come to the city for a day away. To see a show. To visit The Met. To buy pashmina scarves and sunglasses in Chinatown. Though I still love the city, the wide-eyed wonder has dulled. Yet when her feet touched the sidewalk on 51st and Broadway, her grip on my hand can only be called “vice-like.” Even when I tried to let go for a brief moment to adjust my coat, she wouldn’t release her hold. Her gaze traveled up the towering buildings, followed a cab racing through the cross street, studied the hats and scarves peddled along the curb. And, watching her, I was eight years old again. Not in a vulnerable or overwhelmed-child kind of way. But in the discovery (now, rediscovery) of this dynamic city of effusive sights and sounds and smells—a city I love. Now a city my daughter loves. A city to which we will return time and again because it is a city that forever mingles the new with the old and familiar. Like seeing an old friend after a long absence and, though much has happened, your conversation picks up as though no time has passed at all. And aren't those the best kind of friendships? 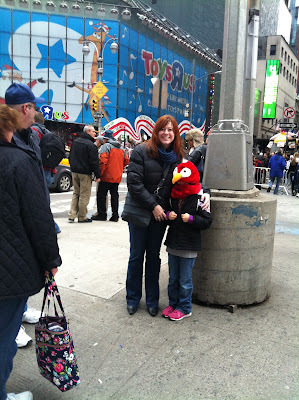 Here we are in Times Square just outside Toys R Us. her that bird hat from one of the street vendors. Great post, Anna! I would love to go to NYC at Christmas time. I'm glad you got some "wonder" back! Lucky daughter! I dream of taking my daughter there one day. 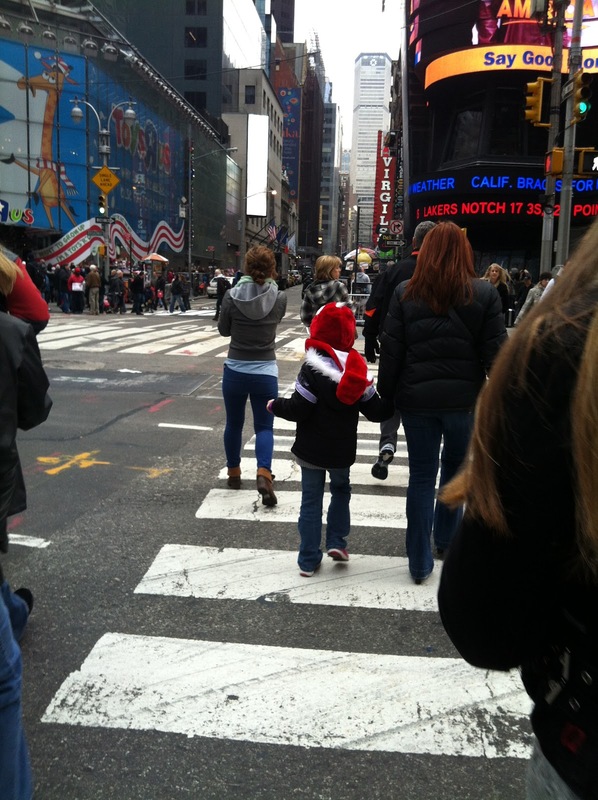 NYC at Christmas time is the best time to go! Thanks for reading Kate. And I'm sure, Amy, that you'll get there with your daughter and if you need suggestions on "must see"s, just let me know :) So fun to see you guys here!